Big wind is coming to a 300-square-mile area south of Martha’s Vineyard, but it’s unclear how it will affect a previously unknown feeding area for critically endangered North Atlantic right whales. The feeding ground was discovered as part of a four-year survey of marine life in an area leased for wind energy development. 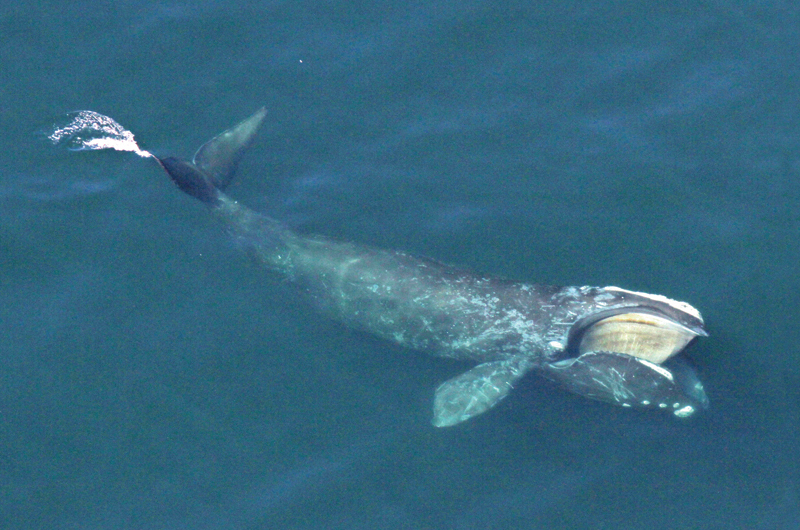 Although the survey documented a variety of marine mammals, birds, and turtles, special attention is being paid to the endangered right whales, which frequent the area from January through May. After first arriving south of Nantucket, they work their way west through the waters south of the Vineyard. “It’s not hundreds of whales, but it is tens of whales,” said Kraus. But when talking about a total population that is estimated at just over 500, every whale counts. The initial four-year study near the Vineyard is being followed up with more surveys and a food study. For the first time, according to Woods Hole Oceanographic Institution associate scientist Mark Baumgartner, researchers know what tiny critters the whales are eating in the region. They start out feasting on the copepod centropages typicus, a crustacean smaller than a grain of rice. Later they switch to calanus finmarchicus, another copepod rich in fat. While any new information about the species is important, this data aims to help guide development of the major wind farms planned off the East Coast. Knowing when the whales visit could suggest that noisy installation work should not be done in the winter and spring, Kraus said. The surveys also provide a baseline that will tell scientists if there is any impact on species after the wind turbines are up and running. The outcome could be complicated by other factors. The North Atlantic waters are warming faster than anywhere else in the world, which may cause changes unrelated to wind development.